Eulalie Swinton McFall Fenhagen, 88, died peacefully at her home at Arbor Landing, Pawleys Island, SC on Tuesday, February 5, 2019. Eulalie was the wife of The Very Rev. James Fenhagen II (deceased April 5, 2012), who was President and Dean of General from 1978-1992 and rector of several parishes in Maryland, the District of Columbia, and South Carolina. The Fenhagens retired to South Carolina, and they were members of Holy Cross Faith Memorial Episcopal Church in Pawleys Island. A funeral service will be held at Holy Cross Faith Memorial Episcopal Church in Pawleys Island on Friday, February 8th at 10:00 a.m.
Mrs. Fenhagen with the Rev. 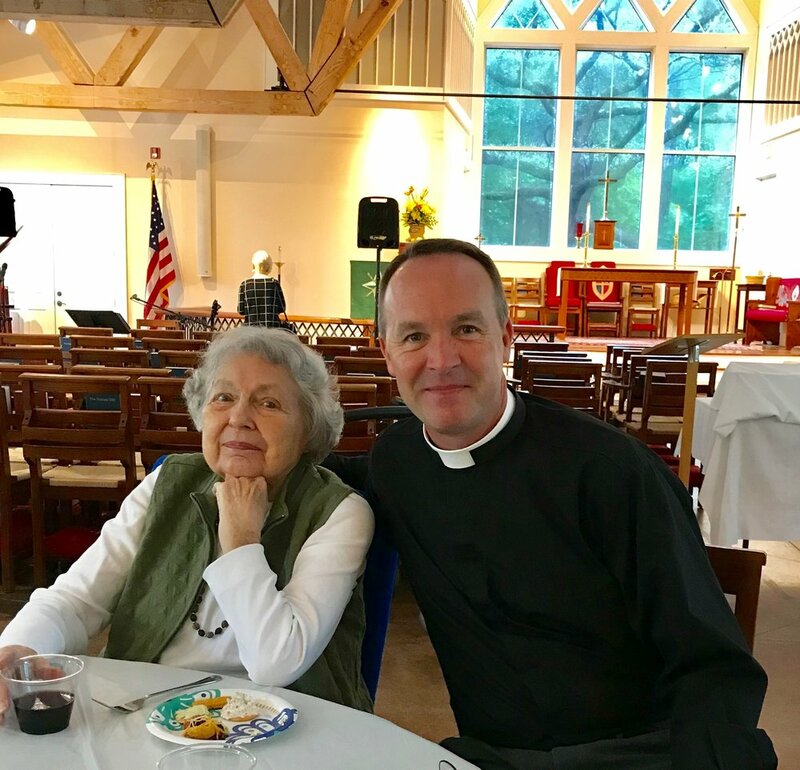 Jason D. Roberson, former General student, now Assistant Rector at Holy Cross Faith Memorial Episcopal Church, her home parish on Pawley’s Island, South Carolina. Mrs. Fenhagen was born June 5, 1930, in Baltimore MD. She attended Sweetbriar College and graduated from Boston College with a degree in Social Work. She lived in Columbia, SC, Washington DC, Hartford, CT, New York, NY, Georgetown, SC and finally Pawleys Island, SC. She dearly loved her three children: daughter (Leila, deceased November 7, 2005); sons James Corner Fenhagen III (Julianne) and John McFall Fenhagen, as well as two grandchildren, Aaron David Fenhagen and Jessica Moreno Trahan. Her full life was a unique mix of gracious hospitality, honest critique, passion for social justice, compassion for those in need, and a deep spirituality combined with a feisty spirit and a robust sense of humor. The breadth and depth of her experiences made their way into stories she shared to mentor, enlighten and entertain her family and numerous friends around the world. A funeral service will be held at Holy Cross Faith Memorial Episcopal Church on Friday, February 8 at 10 am, and a committal service will be held at St John's Georgetown Parish, Washington, D.C., at a later date. In lieu of flowers, memorial contributions can be made to Holy Cross Faith Memorial Episcopal Church, P.O. Box 990, Pawleys Island, SC 29585, or Tidelands Community Hospice Inc., 2591 N. Fraser St., Georgetown, SC, 29440. Sign an online guestbook at www.goldfinchfuneralhome.com. Goldfinch Funeral Home, Beach Chapel is in charge of the arrangements.